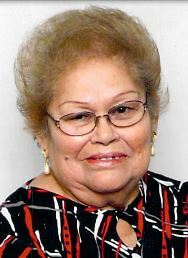 Mathis – Adelina C. Cortez passed away peacefully on April 3, 2019. She was 80. Adelina was born in Santa Monica, Texas on October 10, 1938 to Alberto and Gumecinda (Medina) Cantu Sr. She was a resident of Mathis, Texas for most of her life and formerly of Sinton and McKinney, Texas. Adelina was aHomemaker. Preceding in death is here husband: Inez Cortez; parents: Alberto Cantu Sr. and Gumecinda Medina; sisters: Amparo Gonzales and Alicia Reyes; son-in-law: Gregorio Hernandez III and Jaime Benavidez. Survivors include her son: John Cortez (Leigh Anne) of Beeville, Texas; daughters: Irma C. Hernandez of Sinton, Texas; Elsa Gonzales (Frank) of McKinney, Texas; Nora Benavidez of Odem, Texas; brothers: Arnold Cantu (Minnie) of Lewisville, Texas; Alberto Cantu, Jr. (Delia) of Orange Grove, Texas; Abel Cantu of Princeton, Texas; Arturo Cantu of McKinney, Texas; sisters: Angelita Gomez (Frank) of San Patricio, Texas; Pat Coronado (Mike) of Farmersville, Texas; 17 grandchildren; 28 great-grandchildren. Visitation will be held Sunday, April 7, 2019, 2:00 PM at Resthaven Funeral Home Chapel, Sinton. A rosary will follow the same evening at 7:00 PM at the funeral home. The Funeral Mass will be celebrated Monday, April 8, 2019, 10:00 AM at Sacred Heart Church, Odem. Burial will follow in Edroy Cemetery, Edroy.